Africa Travel Magazine had the tour of a lifetime at the ATA 6th Cultural and Ecotourism Symposium in Fès, Morocco's Imperial City. Even though the ATA conference agenda was stretched to the limit, many took time off to visit the Medina and other historic attractions that make this great city such a magnet for those interested in the cultural aspects of tourism. Fortunately, being mostly travel agents and tour professionals, many will return as hosts of their own escorted tours of Morocco. After all, that's the main reason why hundreds of us from the USA, Canada and Africa Chapters get together at least twice a year in a different African city. By the way, this is our encore for Morocco; a very successful, fun-filled event was held in Marrakech six years before. Although my time was short, I journeyed into the heart of the Medina for several hours, where, among other experiences, I was given a short course in the making of carpets, Moroccan style. This phase of my education was prompted by a breakfast conversation that same day with my friend and colleague Council Irwin, a Travel Agency owner and President of ATA's Detroit Chapter. Council has several of these beautiful carpets in his home. He aroused my curiosity enough that I made it a point to seek out and interview Omar, who owns a carpet store with a seemingly endless inventory (see above photo) . Myself and others will expand on this fascinating story about Moroccan carpets and other facets of our visit to Fès later as we continue our series on the Great Cities of Morocco. We will also provide interesting background information from the Morocco National Tourist Office such as the following. Located in the Fès -Boulemane region (altitude: 415m/1300ft, on the Saiss fertile plains, between the rich Middle Atlas and Rif forests, Fès is the very pulse and the cultural, intellectual, and spiritual capital of Morocco. Inherited from time immemorial when Fès, then an imperial city, ruled over most of the Maghreb, a multitude of vestiges and treasures are only waiting to be discovered by its visitors, notably behind the walls of its haunting medieval city, the Medina. A spiritual Tourist Mecca thanks to its famous Karaouiyne formerly attended by great scholars from around the world. Fès is also the guardian of Arabic-Moorish art. The Fès medina is famous for its merchants, its artists and talented craftsmen still carrying on the trade traditions. Its many quarters are specialized by guilds, and the crafts industry is the drving force behin the old city. Among the special crafts Fez is famous for : fine woodcarving, brassware, silks, pottery, leather goods and bookbinding. Andalusian music, Berber songs and dances are equally appreciated. The Medina hides numerous aristocratic mansions and magnificient palaces that, from the outside, you cannot even begin to imagine exist., Wandering around the maze-like narrow streets of Fez you are taken back into the past, witnessing its social and cultural treasures and minglings. How many Arab, palestinian, Berber, Andalusian or Saharian civilizations have left their marks in the area Visiting this amazing city teeming with life and history, with past and present subtly interwoven into its very deep recesses, is both mind-boggling and fascinating. Exploring Fez, the visitors can experience a journey that will throw them, beyond biases and prejudices, into the living memory of a civilization close to the one of medieval Europe. Through the violent clashes of centuries and cultures, they might think they are going back in time. A stay in Fez, on the other hand, is not complete without a taste of the Fassi cuisine, one of the most renowned in Morocco and the world. 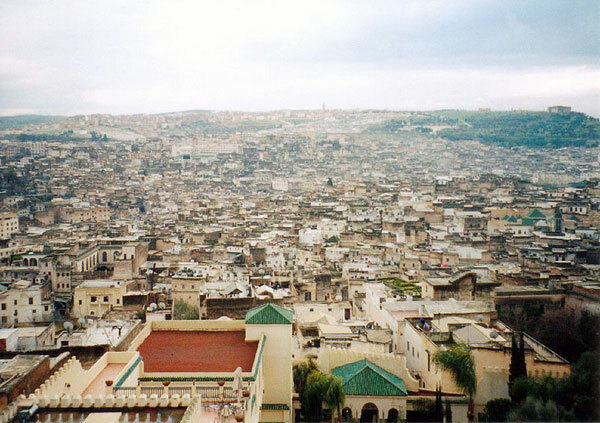 As the Kingdom's original capital (808 AD), Fez is known as "the most imperial city of them all. " Within an hour's drive are three major historic centers and tourism destinations, each one a jewel in the country's radiant crown. Fès is surrounded by lakes, the Atlas Mountains, small cities like Ifrane and Axrou, full cedars, and other rare places. The Morocco National Tourist Office will sponsor a full day tour for all ATA delegates to Meknes, an Imperial City famous for its Bab Mansour gate, the Royal Palace of Dar el Makhzen and the ruins of Dar el Kebira, with two ornate mosques and over 20 pavilions Photo (right): Fez is famous for its sheep skin Tanneries and leather crafts. A leather shop's terrace rooftop in the Tanneries Quarter of the Medina offers a fascinating view of the enormous dye pits. Every few days the colors are changed. standing guard on the hillside, is another attraction to rave about. Volubilis . Close to Meknes is Volubilis, the most important Roman ruins in all of Morocco. In 1997, this rich legacy won Volubis the classification "World Heritage Site "
and former capital of the Mauritanian Kingdom. The Souk of Meknes (above left) . A large variety of colorful handicrafts are displayed. it leads from the Imperial City and Lalla Aouda esplanade to El-Hdim Square. An extraordinary complex founded by King Moulay Ismail which at one time housed granaries (HRI) and a House of Water "Dar El-Ma."